The Free Software Foundation believes the Nintendo 3DS' Terms of Service are too restrictive. Solution? Mail Nintendo a ton of bricks. The seemingly non sequitur protest is in response to the TOS that all 3DS owners implicitly agree to when purchasing the handheld. Key among the Free Software Foundation's complaints is that the agreement gives Nintendo the right to collect user data at will and forbids modifications to the machine. Of particular interest to the group is a line in the 3DS TOS warning against unauthorized alteration of the handheld or the use of unapproved software. In layman's terms, this would be the warning against modifying the 3DS so that you can play pirated games. FSF campaign manager Joshua Gay however, sees it as slightly more sinister. "This combination of legal and technological restrictions make the Nintendo 3DS dubious, devious, and defective," Gay claims. Additionally, in a recent blog post Gay characterizes the TOS as "unbelievable," says the agreement "should not be accepted," and calls on his supporters to protest the gaming giant. How? By donating cash to the FSF, who will then mail cardboard bricks to Nintendo. 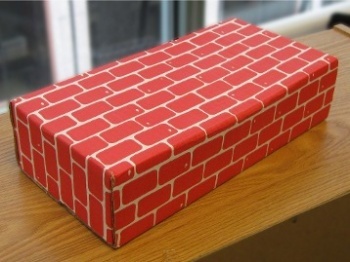 The goal is to send 200 of these faux bricks to the firm by May 18. Still wondering what in the name of Samus Aran do imitation bricks have to do with the Nintendo 3DS, its TOS agreement or digital rights management? The gesture is presumably a tongue-in-cheek play on the idea that the agreement gives Nintendo the right to "brick" (ie, disable) a 3DS for essentially any reason it might see fit. It's a bit of a stretch, but I suppose it makes as much sense as fans of the TV show Jericho mailing 20 tons of peanuts to CBS.